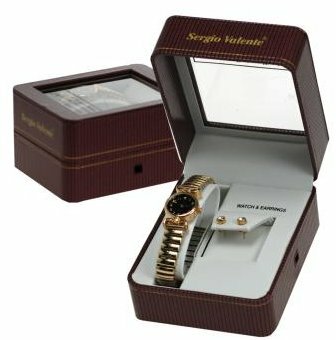 The Sergio Valente watch and accessory gift set comes in a very beautiful pinstriped gift box with a velvet insert. Batteries May Need to be replaced. 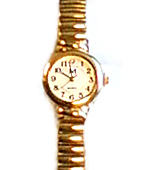 Sergio Valente Watch & Accessory Gift Set Collection! 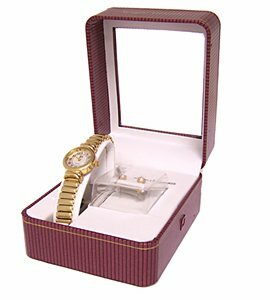 Choose from 2 different styles of Sergio Valente ladies gold tone watch gift sets with either white faced or black faced dial, both with accompanying crystal earrings. Shipping and handling is free within the 48 continental United States. An additional fee of $15 will apply for delivery to Hawaii, Alaska, Puerto Rico and Canada and will be added to the fulfillment record prior to shipping. We will be unable to accommodate deliveries to any other international destinations. Shipping & Handling: Free shipping within the contiguous United States. If shipping to Alaska, Hawaii, Puerto Rico, or Canada $15 additional. For additional quantity, shipping is $4 each.